Group Statements consists of two separate volumes and represents a thorough update of the eighth edition in light of the adoption of IASs and IFRSs and includes theoretical discussion, illustrative examples and self-assessment questions. 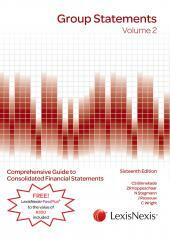 The purpose of this book is to set out the principles and conceptual issues of consolidated financial statements as based on International Financial Reporting Standards (IFRSs). It focuses on the principles of control and consolidation techniques in preparing consolidated financial statements for a group of entities.